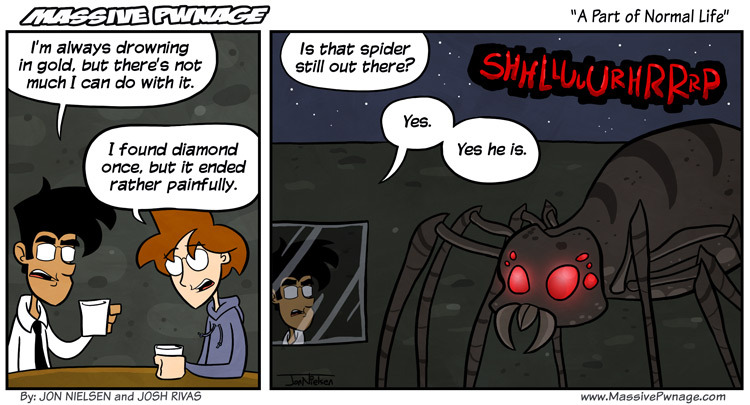 Minecraft Week continues here at Massive Pwnage with a GIANT SPIDER! At least, I think it’s Minecraft week. Are we going to have another one on Friday, Locke? I have no idea! Bah, I’m still calling it Minecraft week. That’s all I’ve been playing anyway. Man I hate that slurping sound. This entry was posted on Wednesday, February 9th, 2011 at 12:00 am and is filed under Comics. You can follow any responses to this entry through the RSS 2.0 feed. Both comments and pings are currently closed. Mobs spawning in your house is the WORST. I go way overboard with torches just in case. 4: Make an overhang on your roof so Spiders can’t climb up it. Damn you Ence! Getting me addicted to Minecraft! I couldn’t stay away after seeing the last comic and now i play it almost all the time! TORCHES! EVERYWHERE! OUTSIDE, INSIDE, DIG HOLES IN WALLS JUST SO YOU CAN TORCH THEM! GEHEHEHEHHEHEHE! I have excess coal. Torches are good. However I hate spiders, not even the sun will kill them, you gotta get a bow, they’re just annoying. SU is an amazing thing… Just finished reading your comic from start to end, and will be back soon for more!